Coming to the healthy part- Salad section, this is one salad which I often do and goes into my families tiffin boxes for lunch. Its just a tummy filling salad and so healthy. 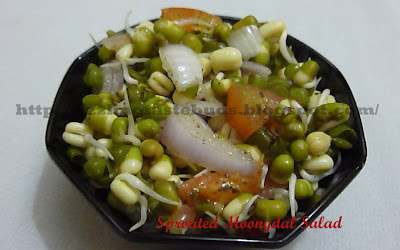 Just add any veggies you like to this and an amazing salad as per your tastebuds is ready in minutes. I was running out of veggies in my refrigerator, so had to skip the veggies and in goes tomatoes and onions. 1. Mix all the ingredients together and your salad is ready to be served. Thats it. Enjoy and be healthy.